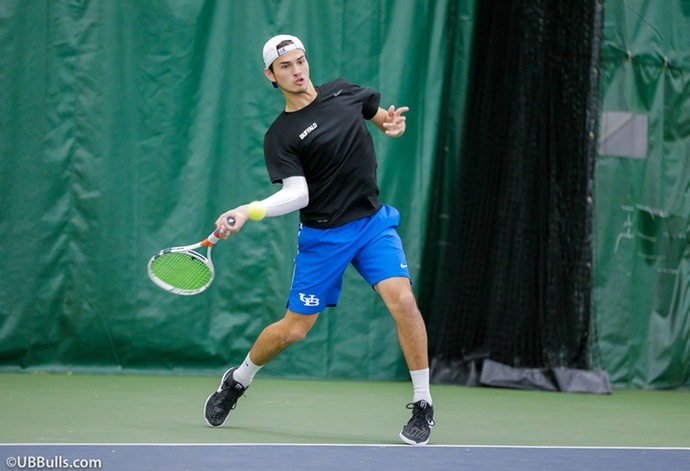 BUFFALO, N.Y. -- The University at Buffalo men's tennis team began the 2018 Fall season this past weekend and had impressive results in both spots as they sent half of the team to the Ivy Plus Invitational and the other half to the Binghamton Invitational. It was an impressive field at the Ivy Plus Invitational, held on the campus of Princeton University, which featured a number of nationally ranked opponents. Senior Ethan Nittolo won the Jadwin Gold flight, going a perfect 4-0 on the weekend. He opened the tournament with a 7-6 (4), 5-7, 7-6 (5) win over Nick Watson from LSU, and then picked up wins over opponents from Brown and Harvard. In the finals he defeated Jason Hildenbrandt of Penn, 6-4, 2-6, 10-2. Junior Vilhelm Fridell made it all the way to the finals of the Cordish Gold flight, beginning with a 6-1, 6-2 win over his opponent from Tulsa. He then picked up a win over Big 12 foe Oklahoma and defeated Peter Conklin of Dartmouth to reach the finals before falling to Davey Roberts from Princeton. Fellow junior Hao Sheng Koay won his opening match in the Nassau Gold flight over Ryan Cheng from Yale, 4-6, 6-3, 6-1, while Nickolas Frisk won his final match in the Pagoda White flight, 6-4, 5-7, 10-7 over Logan Weber from Harvard. In doubles, Nittolo and Koay overcame an opening round loss to their opponents from Penn before coming back with an 8-6 win over their opponents from Minnesota. In Binghamton, UB got some strong performances from its newcomers in both doubles and singles action. In doubles, newcomers Valdemar Holm and Simon Wibler won both of doubles matches on Friday as fellow newcomer Jonah Murphy joined sophomore Matt Johnson, splitting their doubles contests. On Saturday, the Bulls switched up their doubles combo as Holm and Johnson won both of their matches, while Wibler and Murphy dropped a pair. On Sunday, it was Holm and Murphy who split two matches, while Johnson and Wibler won both of their contests. In singles action, Holm won two of his three matches, picking up victories on Friday and Saturday, including victories over opponents from NJIT and Binghamton. Wibler and Johnson each picked up weekend victories as well for the Bulls.